The process of selecting the XY fraction of the section to sample involves two steps. In this section we will discuss considerations for establishing the parameters of your probe. First, a counting frame size needs to be determined, then the distribution counting frames in our region of interest needs to be established. Finally, we will discuss how to select a height sampling fraction for your tissue sections. The ratio of the counting frame area to the area formed by the distance between counting frames is known as the area sampling fraction, or asf. To determine the size of the counting frame for use with the Optical Fractionator use a high magnification objective lens with a high numerical aperture (NA) is required. Typically a 60x oil or a 100x oil with 1.4 NA is used. A high NA objective provides a thin depth-of-field. The thinner the depth-of-field, the more accurate is the z position information. A good choice is to use a counting frame that is large enough to count 1 to 3 cells on average. Make sure that the counting frame is not so large that the edge effect comes into play. More information on the counting frame and the edge effect can be found in the sections on the counting frame. In this study, it was determined that it was appropriate to count aprroximately 600 cell to achieve the desired level of accuracy of the population estimate. See the section on CE and study design for more information. Since 12 sections have been chosen for this study, it will require approximately counting approximately 50 cells per section (12×50 = 600) to achieve this target. Now take into consideration that the counting frame is sized to count an average of 2 cells per counting frame, and will take approximately 25 counting frames per section (2×25 =50). Notice that the sections vary significantly in their profile areas. Section 1, 2, and 12 have relatively small areas compared with the other sections in the series. To take all this into consideration a sampling grid of 300×300 um was selected. Figure 3 shows section number 7 from the series, shown at medium magnification, superimposed with a rectangular lattice with uniform distances between the lines in directions X and Y. The position of the lattice on the section was randomly selected. This lattice defines the positions of a SRS set of microscopic fields (indicated as gray rectangles) with uniform distances between the fields in directions X and Y of 300x 300 um at which the section is then inspected at higher magnification. 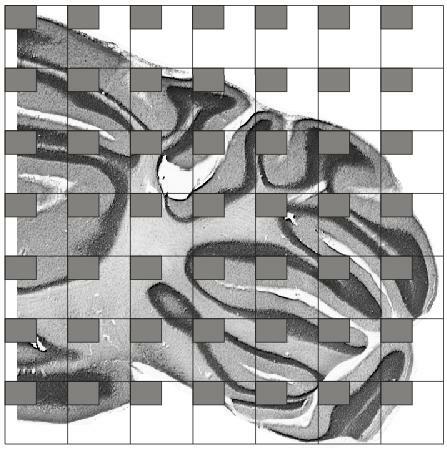 The gray rectangles represent high magnification fields-of-view, similar to Figure 2. In this example the asf = 9375 (the counting frame is 125 x 75 um) / 90000 (the sampling grid is 300 x 300 um). The final issue is to decide the is size of the guard zones and the Optical Disector height. Typically, guard zones are used to avoid cutting artifacts that occur at the upper and lower surfaces of the sections. Guard zones reduce the available section thickness that can be used for counting. The height of the Optical Disector divided by the mean tissue thickness is the height sampling fraction or hsf. Figure 4 shows an Optical Disector from section 7 in Figure 1. 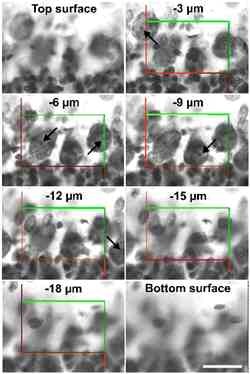 The figure shows the selected microscopic field at the top surface of the section, at six consecutive focal planes below the top surface with a distance of 3 µm between the focal planes, and at the bottom surface of the section that was found 20 µm below the top surface. Between -3 µm and -18 µm the microscopic field is superimposed by a counting frame; explained in detail in the section Optical Disector. 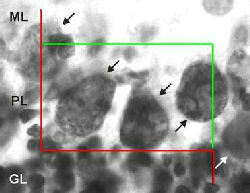 As shown, three nucleoli of Purkinje cells (marked with arrows at -6 µm and -9 µm) fulfilled the counting criteria and were therefore counted. 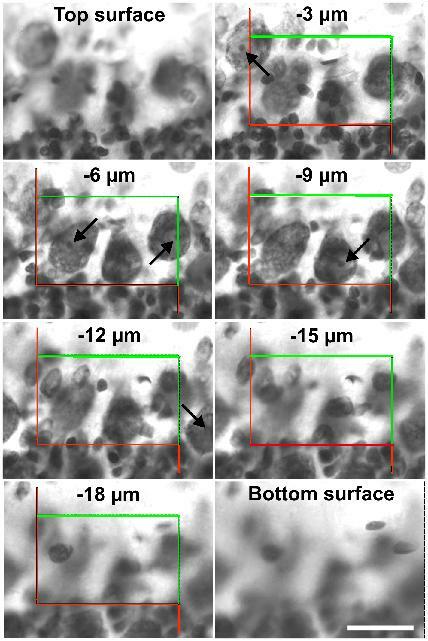 Two other nucleoli of Purkinje cells came into focus at -3 µm and -12 µm, respectively (also marked with arrows), i.e., within the range of the section thickness covered by the height of the Optical Disector. However, both nucleoli were not found entirely within the counting frame or at least hitting one of its inclusion lines and were therefore not counted. Provided the nuclei or the perikarya of the Purkinje cells would have been selected as objects of interest in this example, also, the cells found at -6 µm and -9 µm would have been counted. At this point all of the sampling parameters have been established. None of these settings should be changed while processing this set of slices. Total population = total cells counted x 1/ssf x 1/asf x 1/hsf. Accordingly, the estimated total number of Purkinje cells in the right cerebellar half of the rat brain shown in Figure 1 was 155,803. 1. Prepare a set of SRS sections. 2. Select a counting frame size. 3. Select a sampling grid size. 4. Select the size of the guard zones and the Disector. 5. Randomly place the sampling grid onto each slide. 6. Use the counting rules at each sampling site to obtain a cell count. 7. Process all of the sections. 9. Calculate the number of cells and the CE.